The daylilies mix with liatris, coneflowers and grasses. late summer blooming perennials, grasses and autumn asters. I wish I could photograph how beautiful all the greens look together! 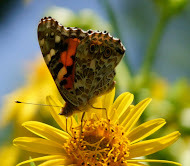 In the mean time here are a few plants we wish were natives along with native plants we love. But before we go~ A big round of applause and thanks to Carol (May Dreams Gardens) hostess extraordinaire of Bloom Day which is normally celebrated on the 15th of each month! Just be sure and dead head the faded blooms. She is charming isn't she! I know that Morning Glories are just a tad aggressive, But can you beat this color! yes, we are still friends even though we are breaking up! Day Lily and a friend or foe? What is that little pest up to? Hyperion, a grace old variety of daylily that I prefer above them all. This 80+ year old beauty has a sweet fragrance that makes her even more appealing. How did these get in here! 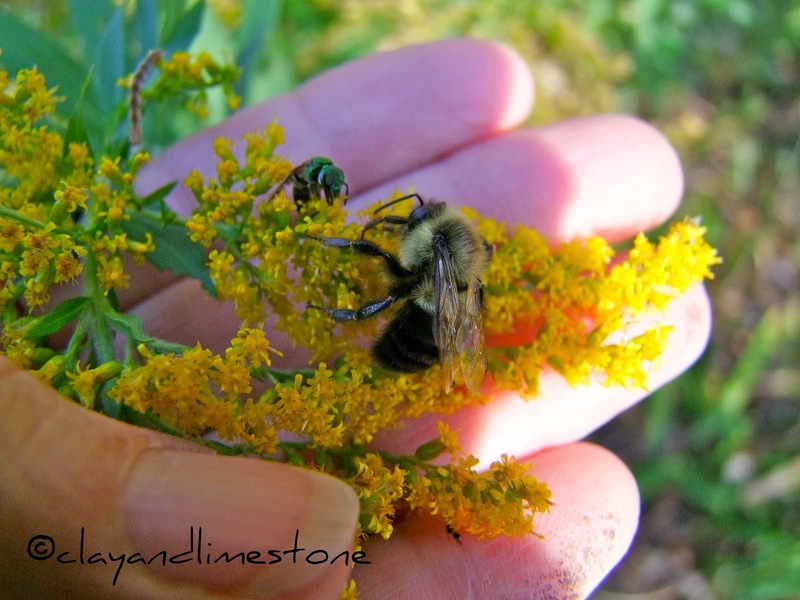 So glad you stopped by~I hope your garden is filled with beautiful flowers, beneficial insects and good friends. A beautiful bloom day post! Such vibrant, bright, cheery flowers! Reading your title made me think you were in a very poetic mood when you posted. Great photos Gail. There is a lot of green in my garden right now too. Wonderful photos, I love all the Coneflowers and wish I had the space for such amazing swaths of plants! How gorgeous and I have the Grandpa Ott's morning glory too! Hope you're having fun while away! Love my stachys 'Hummelo' -- the blooms and foliage are so wonderful, aren't they? Your daylilies are so lovely and I think it's great that a zinnia sneaked in there to surprise you. I can tell your foliage colors are great. Our heat and humidity has been so bad that my photos on my blog today were taken after the sun went down and they look so dark without the light. All the green is lovely, Gail, and shows so much promise. But your second photo is dazzling--what a gorgeous display of contrasting colors! And I do like that mullein. I'm sure you've shown it in the past, but I've seen it several other gardens--in person--this year and realize what a striking bloomer it is. Though, I must admit 'Southern Charm' has the prettiest of blooms of any mullein I've seen! Those zinnias are the flowers that keep on giving! Volunteer plants are the best. 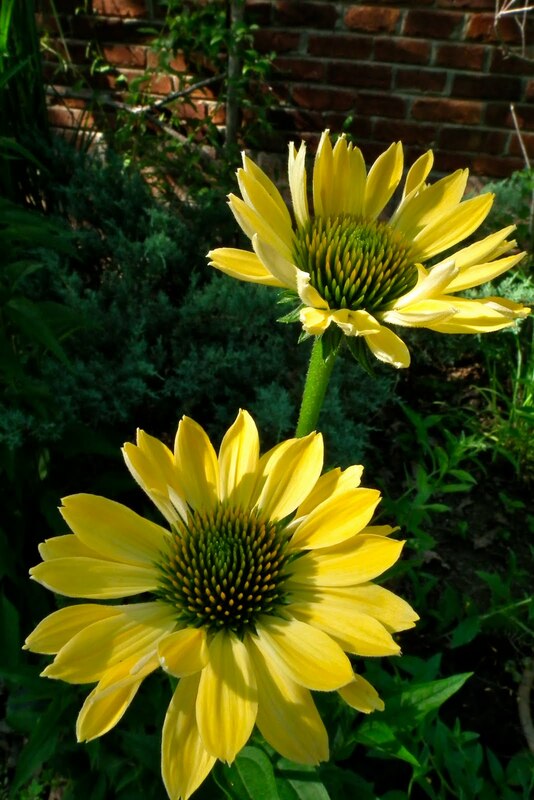 The coneflowers look great! Your bench setting is just like a park! 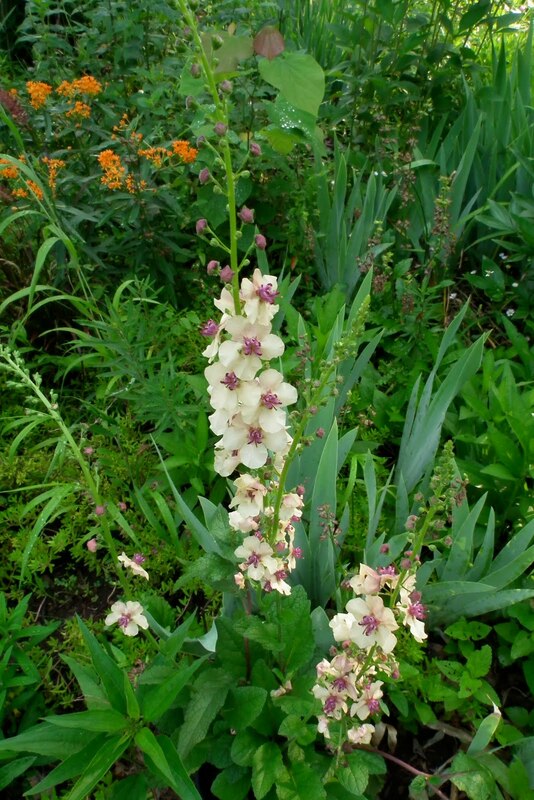 Love the Southern Charm Mullein. I really like those dark daylilies in the second photo. Always love seeing the long shots of your garden with the usual and unusual suspects blooming everywhere:) Those benches are calling my name. I want to just sit on one and take it all in. The colour combination in your second photo is simply spectacular -- I would plant every bed, every container I own in that mixture, if I could. :) All your blooms are, as always, lovely. Fabulous foliage and flowers Gail! I especially love the riotous party going on in your second photograph, it just has a fun carefree quality about it. They all look so colorful, and beautiful. I am a big fan of the morning glories, around here we don't usually have them growing well. Not enough heat, but that has been changing in the last few years. Oh goodness, just fabulous. I think we have the same kind of sensibility about plants and I a feeling I need you to come and help me over here! Such beautiful blooms ... love the colours and the planting in that second shot!! You Mullein is a gorgeous plant ... that's a new one for me. 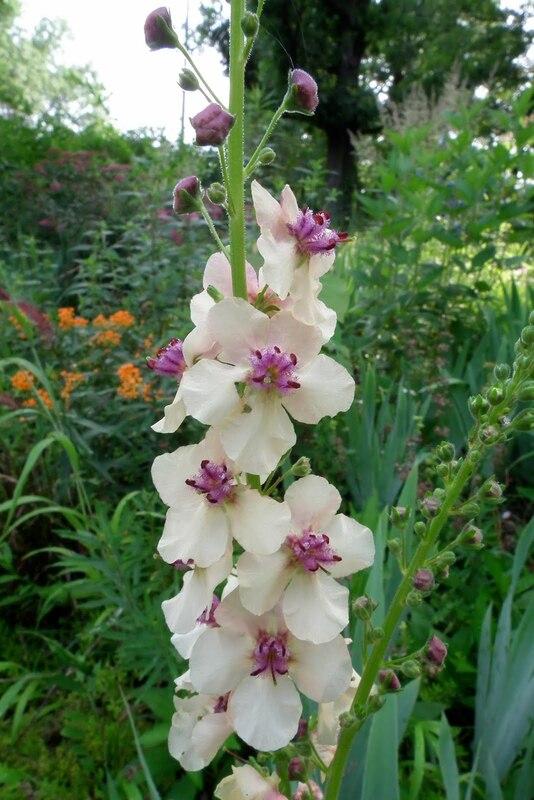 I love how that Hyperion looks and would love to have a daylily that's fragrant. I also really like how those daylilies integrate so well into the native landscape (the photo with the liatris, etc.). Everything looks so nice! The first shot looks like a very peaceful place to sit. I like the dappled light on the bench and plants. Phlox paniculata 'Laura' has a nice white eye, making the colour stand out. And, what a great reflection of what's in bloom in your garden. So enjoyed your mid-June garden tour, Gail. Surrounded in heavenly beauty, you must be delighted! That bench looks so inviting. I just can imagine sitting there and looking at your garden. Even the areas of green, without blooms, looks fabulous. Thank you Gail! Your June garden is beautiful. It inspires me to get out there and pull weeds! What lovely blooms you have in June, Gail. Love all those different daylilies -- there's just something magical and old-world about them. I'm amazed at the profusion of blooms on my Coneflowers right now, too - waiting on one special one that I got mail order last year to send it's first bloom up. Happy GBBD. Beautiful blooms Gail. Hyperion blends perfectly with the natives. I think your photo of the greens captures the beauty nicely. How grand it must be, resting on the bench enjoying your restful, verdant view. and your ""Bloom In June"" is absolutely fantastic work. dont stop I'll definately be back again soon! or newsletter service. Do you have any? Please permit me recognise so that I could subscribe. My oh my. What is that red daylily in the second photo? ?